Were there really giant sloths? Are sponges animals or plants? Why can’t dogs be vegetarians? 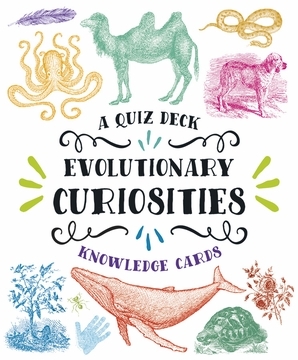 This deck asks the questions about life on Earth that you never knew you’d always wondered. And the answers, on the backs of the cards, are informatively written in plain English, so that we all may expand our understanding of the world around us. The author has included everything from why happiness is evolutionarily advantageous to how sharkskin relates to teeth. Perfect for independent learning or trivia night among friends, this deck of Knowledge Cards sheds light on evolution’s curiosities, like the venus flytrap—what’s that about?